So it's the most hectic time of the year for teachers.... (I am a teacher in case you didn't know that about me) - hence the quietness of the blog of late. I haven't managed to work on much of anything, except deadlines, let alone rustle up a blog post! I have to admit that after the year we've had, I'm utterly spent. I'm making myself take an enforced break today (I even chose to mark student work because it means I had to sit down! Things are getting desperate when I'm this tired!). So I was pondering my knitting. And why I haven't been knitting as much lately. I have some lovely projects that I *want* to make. Some projects I'm *preparing* to make, including this Gilmore Girls Mystery Knit-A-Long* that I'm seriously excited about. I realised I do have some projects underway, but they're just not calling my name at the moment... The reason why? 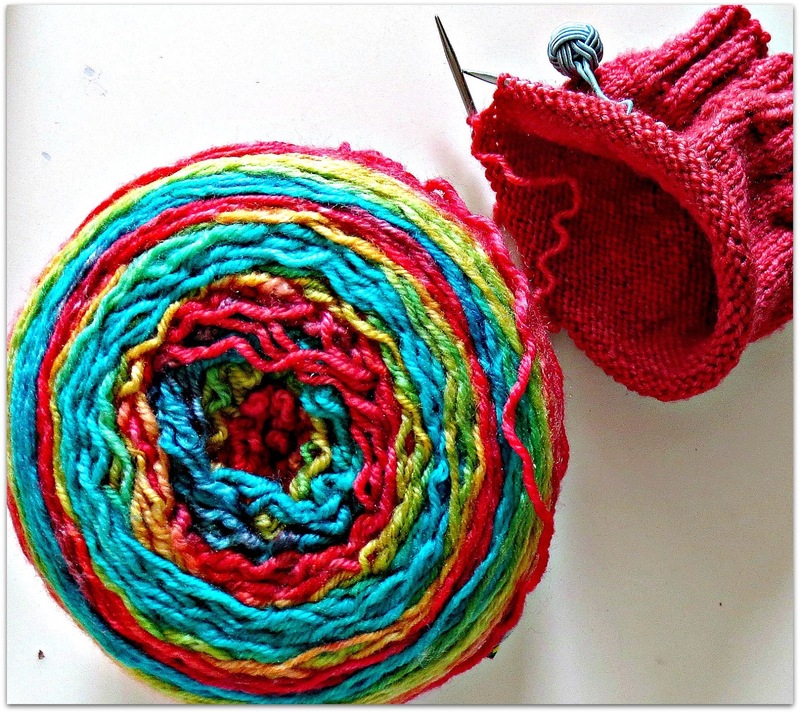 It's a sad day when a knitter comes to the realisation of the need to rip a project. A lovely podcast I follow (the Yarniacs, I do recommend!) a while back mentioned that the 5 stages of grief apply quite aptly to the process of coming to terms with undoing all those hard-won stitches! It's taken a couple of weeks to process whether I *need* to begin again, and then a little more time for the acceptance... Now I have to come to terms with actually undoing my projects. You may be wondering why I am going to undo some perfectly lovely knitting (because surprisingly in this case, it's not due to knitting mistakes - that kind of undoing does happen on a regular basis. And yes, it makes me come a little undone as well as the knitting). Princess asked for a shawl of her own. I'm thrilled to oblige! We decided to use the remnants of a ball of Star Finch by CircusTonicHandmade that I used to make my Sweet Pie Socks (more information will come some day! ), which serendipitously matches perfectly with a ball of coral Luxury from Bendigo Woollen Mills. I assiduously researched Ravelry to find a shawl that I could knit the body in the solid colour, and then gradually incorporate the variegated yarn at the edge, which ideally would be some kind of simple lace. Something suitable for a girl. I found a lovely pattern called Snowflake Party. If you know me (and Princess), you know how much we love snow! I got all excited. 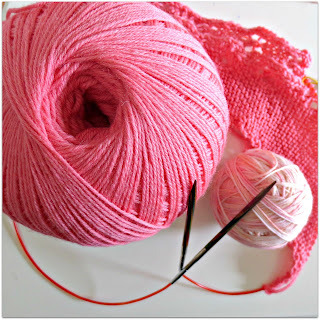 Which made me forget that it needed to be knit horizontally so that the lace could be in the variegated yarn. I remembered *after* I started knitting it! The Snowflake Party shawl is knit diagonally. It could still be lovely, as there will be more snowflakes towards the end, but it still wasnt quite what i envisaged. The pattern is lovely, and I will return to it for a future shawl! Instead I think I'll make the Blossomfield Shawl designed by one of my favourite designers, Meg Gadsbey. It is knit horizontally, and designed so that the lace flowers are knit in a lighter shade. My other project waiting to be ripped is a pair of rainbow socks. I was excited to buy some yarn that has a symmetrical colour gradient. It's designed for knitting two socks at a time, using the outer end and inner end of the yarn at once. I tried to cast on two at once, but got into a dreadful muddle. Instead, I pulled out my teeny tiny little sock needles, to knit one at a time. I'm getting used to the little needles, and quite liking the technique. It's easier than using a magic loop or two circulars, as you just keep knitting around and around. But as the socks have emerged, I think that the stripes are a little too wide. So I'm going to knit a larger sock. 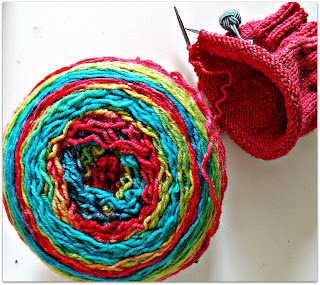 This will mean that the stripes will be a slightly narrower, and should create a fun sock! Big Stripe! I haven't even reached the end of the first colour yet! Of course, I could continue with both of these projects as they are, and they would be perfectly lovely. But I make things for the joy that it brings, and I think both of them would be better if I change them slightly. I'd rather undo this relatively small amount of work now, than wonder if the alternative would have been lovelier once they are finished! It may be crazy, but it makes me happy! Now that I've come to terms with it all, I'm off to undo some knitting! Do you ever undo projects? Why? Have you ever continued with a project and then regretted it? 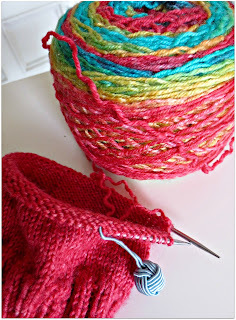 * Knit-a-Long = knitting along with a group of other people working on the same project or theme, usually on Ravelry. Bonus if prizes are part of the fun; Also: Lots of fun, learning, swapping tips!